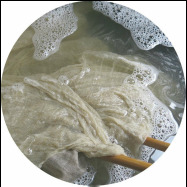 We first boil off the layer of starch and contaminants on the fabric with a alkaline soap mixture. This allows for better absorption of dyes. 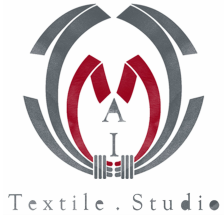 We design and mark the fabrics with a water soluble ink. They are then folded and stitched up. The threads are pulled to create folds. Areas left exposed will absorb the dyes. The compressed fabrics are soaked in water for a few hours for better absorption of dye. It is dipped into the indigo vat and moved about gently. When taken out, the fabric is green. The indigo oxidises and becomes blue. Dark shades of indigo can be achieved by repeating the process up to 15 times. When the preferred shade of blue is obtained, we rinse and wash the fabrics to remove any excess dyes. The stiches and bindings made onto the fabric are then cut, unstitched and unbound. The fabrics are then dried, ironed and ready to be cut and stitched up for our next collection.